Alice Verney is intent on achieving her dreams. Returning home to England after a scandal forced her to flee to Louis XIV's France, she is anxious to reestablish herself in the rowdy, merry court of Charles II. But since the Restoration, old political alliances have frayed, and there are whispers that the king is moving to divorce his barren queen, whom some wouldn't mind seeing dead. Loyal to the queen, Alice sets out to discover who might be hatching sinister plans, suspecting her own father is among them. Uncovering more than she bargained for, Alice learns that secret schemes are at play, war is on the horizon, and King Charles himself may have betrayed his country for greed. Her ambitious plans are threatened at every level, especially when she finds herself falling in love with the wrong man. 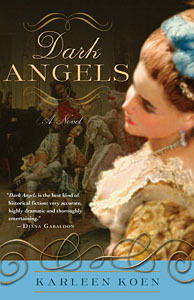 Sparkling with all the passion, extravagance, danger, and scandal of seventeenth-century England, Dark Angels is a novel of love and politics, of romance and betrayal, of power and succession — and of a resourceful young woman who risks everything for pride and status in an era in which women were afforded little of either. "Best kind of historical fiction...very dramatic, highly dramatic, and thoroughly entertaining" — Diana Gabaldon, Washington Post; Historical Novel Society's Editors' Pick; Doubleday Book Club; Indie Next best seller. I love this novel. Alice displays all my worst qualities, and I adore her for it. This was really fun to write because the court of Charles II is just full of interesting people, and Charles tops the list. I love Brownie's story.